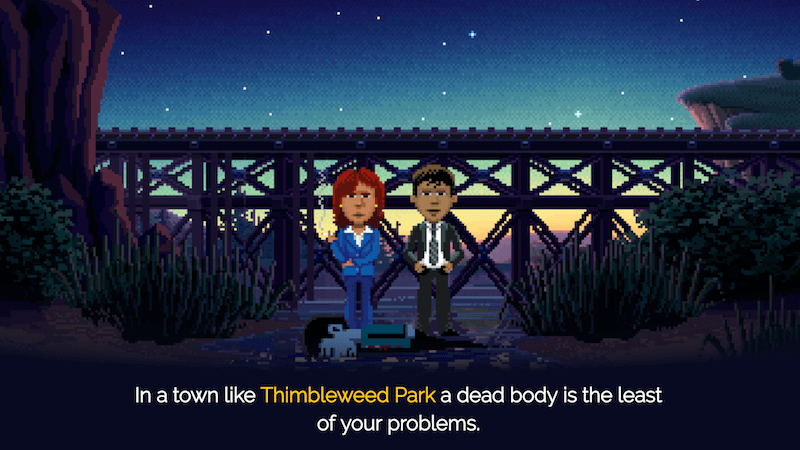 Lately there haven't been that many decent and new point and click adventure games… However Thimbleweed Park is a newbie that caught my attention the moment I saw little teaser screenshots popping up on my feed. A new indie P&C game this I could not miss! And the more I read about it, the more I was looking forward to playing. Especially when I found out that some of the former Lucasfilm Games employees created this beauty! It's not really a surprise if you see some of the masterpieces that are on their portfolio. Think of Zak McKraken, Monkey Island, Maniac Mansion… all the big ones! Together they started a new Indie game studio called Terrible Toybox. 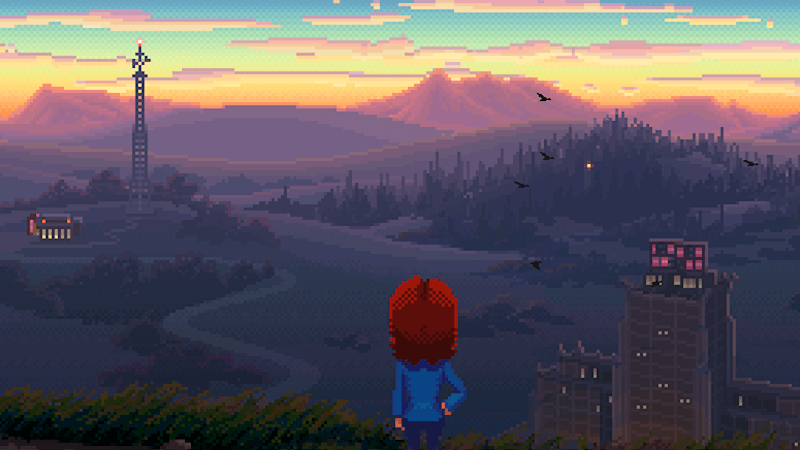 So, during spring they finally released Thimbleweed Park, so I grabbed my copy and here we are! Time to find out what this game's all about! The game starts with a mystery meeting on a rather shady location. Not long after the story turns into a murder mystery that needs to be solved, but who exactly has called in the feds? Apparently nobody knows… but special agents Ray and Reyes both show up at the crime scene to "takeover" the case from the local authorities. Only… they did not consider that another agent other than themselves would show up. So kind of suspicious of one another, they just pretend to be on official business. That's how Ray, a weathered (FBI) agent with kind of a moody personality is forced to collaborate with Reyes, a junior agent from a non-existing headquarters. The signals sure are strong tonight! Oh errr… never mind! You can expect a game that hits you right in the nostalgic feels with a hint of Twin Peaks meets X-files atmosphere. Even though the game is new, but has that classic feel like most of your (or maybe my) favourite P&C games! 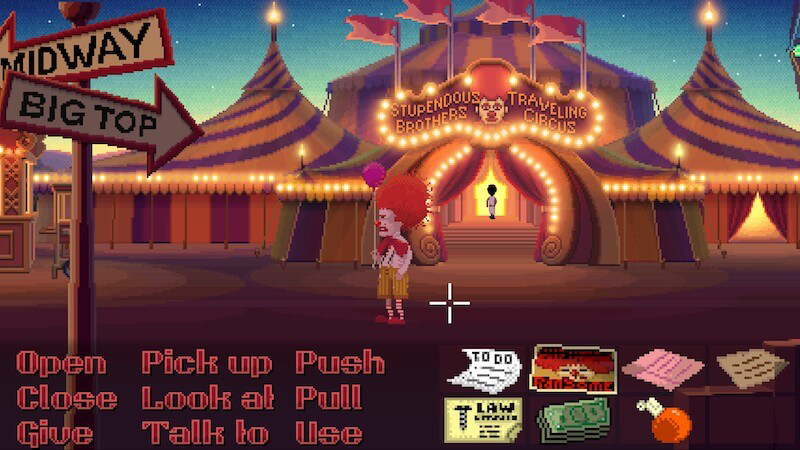 And that's not all, one of the other cool features for this game is that you can swap between characters just like Day Of The Tentacle. The only difference here is that there's actually no time machine involved. That does not mean you're in the same plane though. At some point you might even play a beeping clown! I might have stumbled onto a couple of not so straightforward puzzles, although it's no fun if you can solve everything without any real effort. They let you choose the difficulty level at the start of the game though. However, if you do get stuck completely, you can always call the in-game hotline. The locations and personalities in this game are great! I really dig the vibe they managed to create, it's a modern pixel game but with that nostalgic feel of the old p&c games. And like I mentioned before, the scenery and characters make you feel like you ended up in some kind of a Twin Peaks meets X-files story.